The werewolf is a mythological creature in common in folklore traditions around the world, and the term generally refers to a man who can change form at night and turn into a wolf. Werewolves are considered evil and dangerous, as they are believed to bite, injure, and kill people and livestock. Hillerman borrows the term werewolf to refer to a Navajo wolf (also known as skinwalker), a member of the community who is believed to engage in black magic that is associated with shapeshifting, manipulating supernatural forces, and harming people. 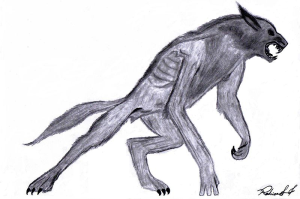 "Illustration of a Werewolf, by Rodrigo Ferrarezi, June 9, 2008" by Rodrigo Ferrarezi is licensed under CC BY. N.d. Werewolf. http://www.britannica.com/art/werewolf, accessed November 3, 2015.